Arlington’s newest indoor cycling studio “Good Sweat” is set to open next weekend with $1 class packages and an altruistic mission. The exercise center will hold a grand opening celebration next Saturday from 11 a.m.-12:30 p.m. at its studio in the Rosslyn’s Colonial Village Shopping Center at 1711 Wilson Blvd. Between April 15-20, Good Sweat customers can buy an unlimited week pass for $1. After April 22, drop-in classes will cost $28 and class packages will cost $99. Hashemi previously told ARLnow she expected to open in March after raising $26,000 in donations last fall to build the studio, exceeding her original $25,000 goal. The company intends to donate a portion of all proceeds for charity. Riders will be able to choose which organization they’d like to receive a portion of their booking costs. The cast of local nonprofits will revolve through the month and will include Urban Alliance, Doorways for Women and Families, and Arlington Food Assistance Center. Employees and clients from the nonprofits featured each month will also get discounts at Good Sweat, reported the Washingtonian. Other proceeds will subsidize low-income customers who want to go for a spin at Good Sweat, Hashemi has said. More from a press release, after the jump. 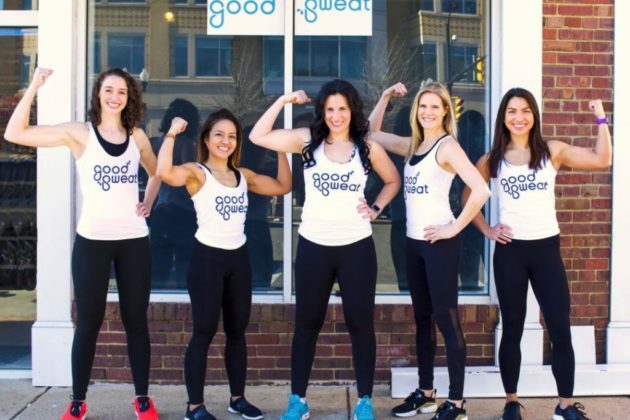 Good Sweat, a first of its kind social impact cycling studio in the area, will open its flagship location on Saturday, April 20, 2019. Good Sweat not only provides a good workout, but gives back to the community as often as possible. A percentage of every class purchased at the studio will be invested back into the community, either through direct donations to local nonprofits or by hosting subsidized rides for those who lack resources. “At Good Sweat, we are committed to giving you the best sweat of your life, all while improving someone else’s,” said Alessandra Hashemi, Good Sweat Founder. “Arlington is the perfect location for Good Sweat’s flagship studio. The local population is fitness focused and extremely socially conscious.” Prior to opening its flagship location, Good Sweat held an online fundraising campaign that raised over $26,000 in 25 days for the construction of the actual studio. A portion of this money was donated to A-SPAN, a local nonprofit with a vision to end homelessness in Arlington County. The community element is what differentiates Good Sweat from other fitness options in the area. Good Sweat will not only build a socially conscious fitness family of riders within the studio, but will also make an impact in the community at large. To do this, Good Sweat believes that people need to be good to themselves first before they can be good to others. Therefore, the Good Sweat model is to provide fun and challenging, beat-driven rides to encourage riders to become a stronger, more giving version of themselves. “Good Sweat is a natural fit here in Rosslyn, and a welcome addition to our neighborhood’s robust fitness scene. 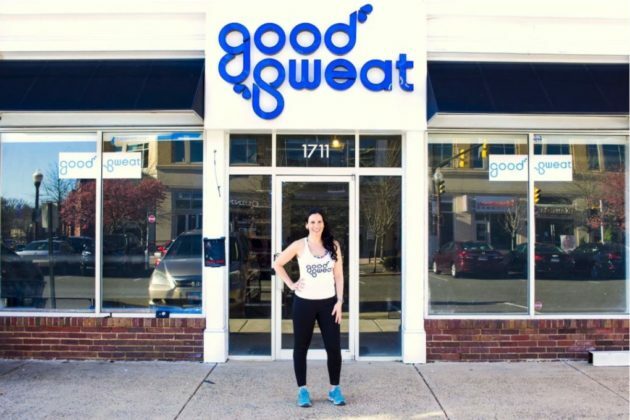 With so many businesses recognizing the importance of giving back to our Arlington Community, I know Good Sweat’s mission to improve the lives of those both in and out of the studio will resonate” said Mary-Claire Burick, President of the Rosslyn Business Improvement District. Good Sweat has held numerous pop-up events, with sponsorship from local vendors, including a series of free indoor cycling classes for the Rosslyn community. At the last pop-up ride, riders brought canned goods that Good Sweat donated to Arlington Food Assistance Center, a community-based non-profit that provides supplemental groceries to Arlington neighbors in need. Good Sweat also held two cycle classes at the Observation Deck in Rosslyn. Riders who participated got incredible views of Arlington and D.C. during the sunset while also giving back to the Leukemia Lymphoma Society, a nonprofit dedicated to fighting cancer and improving the quality of life of patients and their families. Located at 1711 Wilson Boulevard, Arlington, Va., Good Sweat will offer cycling classes on weekday mornings and evening and weekend mornings. For more information, and to sign up for classes, please visit https://goodsweat.co/.